The vegetation of Sinharaja are typical for a tropical lowland rainforest or tropical wet evergreen forest. The loftiness of the dominant trees, the straightness of their bole, the abundance of regeneration and the vast diversity of species are some of the most striking characteristics. The average height of these dominant trees varies between 35-40m. The vegetation of Sinharaja is that of humid wet evergreen forest type with a high degree of endemism. In fact some families such as Dipterocarpaceae show an endemism more than 90%. The untapped genetic potential of Sinharaja flora is enormous out of the 211 woody trees and lianas so far identified within the reserve 139 (66%) are endemic. Similarly, high levels of endemism are perhaps true for the lower plants like ferns, epiphytes as well. Out of 25 genera endemic to Sri Lanka 13 are represent in Sinharaja. The total vegetation density, including trees, shrubs, herbs and seedlings has been estimated to be around 240,000 individuals per hectare, of which 95% comprise individuals of the ground layer below 1 metre in height. The density of trees, lianas above 30 cm girth at breast height, ranges between 600 – 700 individuals per hectare while the number of merchantable individuals of trees of girth greater than 150 cm ranges between 45-55 individuals per hectare. Studies carried out on the fauna of the rainforest have revealed that there is a high degree of endemism among the butterflies, fish, amphibians, reptiles, birds and mammals due to geographic isolation of this rainforest habitat. The rate of endemism is over 50%. The most common deer species is the Sambar and the Indian Muntjac also known as the Barking Deer are found within the reserve. Leopards are very seldom sighted, but their frequent presence has been confirmed by tracks and other signs. Stripe-necked Mongoose and the Golden Palm Civet have been occasionally sighted. The most commonly seen primate is the Purple-faced Leaf Monkey, which is also endemic to Sri Lanka. It is a top birding location for endemic birding where 28 of Sri Lanka’ 34species have been recorded including the recently discovered Serendib Scops Owl and other rarities such as the Sri Lanka Spurfowl, Chestnut-backed Owlet, and White-faced Starling. One of the most interesting and colorful spectacles to be found in the Sinharaja is the presence of mixed species of foraging bird flocks also known as a “bird wave”, a phenomenon commonly found in rain forests total of 100 such flocks were systematically observed. Studies have revealed that some flocks contained 48 species including as many as 12 endemic species which includes endemics such as Green-billed Coucal, the striking Red-faced Malkoha and Crimson-backed Flameback on the middle and upper canopies while the Spot-winged Thrush and noisy flocks of Orange-billed Babblers can be seen foraging for insects at ground level. Flocks of Sri Lanka Blue Magpie, one of the most sort after endemics due to their bright blue and red plumage are often seen close to the research station on the Sinhagala walking trail. 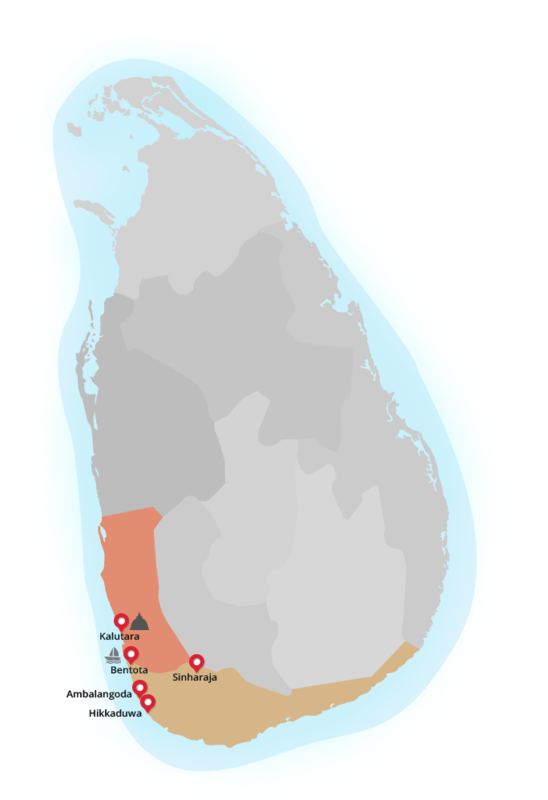 Access: Sinharaja can be accessed from Kalawana from the north-west (most popular option), Rakwana from the north-east, Hiniduma from the south-west and Deniyaya from the south-east which goes towards Galle.